The knight quickly gallops through the gate into his fortress. As soon as he brought his horse into the stable he heads over to the big hall where dinner is served. These play blocks offer many variations. Interlocking panels can be turned around to show different pictures on each side. 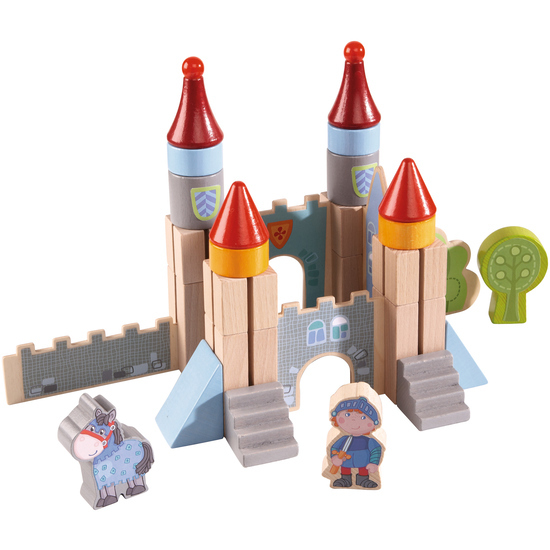 Combined with the building blocks, a fantastic fortress quickly can be set up to welcome the knight home. The little master builders can of course rebuild their fortress over and over again. Flexible building fun, that remains interesting for a long time. Contents: 1 knight, 1 horse, 6 interlocking panels (double-sided), 22 fortress blocks, 1 tree.